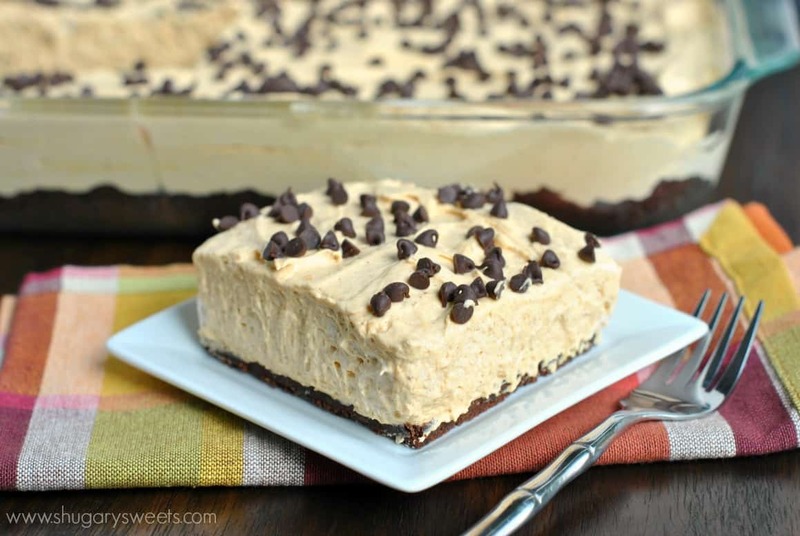 You’re going to want to make a pan of these No Bake Brownie Brittle Pumpkin Cheesecake Bars. Today. Right now. Go! You guys may remember last month when I created these No Bake Brownie Brittle Toffee Bars? Yes? If not go check them out! I’m back with another Brownie Brittle recipe. Thanks to Brownie Brittle and their challenge to “brittle” my recipes, I’m completely obsessed. As if eating Brownie Brittle straight out of the bag isn’t delicious enough..I’ve gone and made another sweet treat to tempt your taste buds! Have you tried Brownie Brittle yet? If not, what are you waiting for? It’s crunchy and delicious, and comes in some out of this world flavors (salted caramel!!). If yes, then you know just how good it tastes. Way back in 2011, the year I started my blog, I made these delicious No Bake Pumpkin Cheesecake jars. I honestly didn’t think they could get any better. Until now. Until I accepted the Brittle challenge. 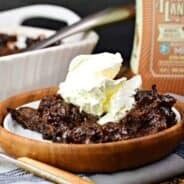 The idea is you take your favorite recipe and “brittle it.” By replacing the gingersnap crust with Brownie Brittle, this treat is over the top good!! Seriously. The crunchy chocolate chip Brownie Brittle base. The creamy, pumpkin cheesecake filling. And the chocolate chips. Wow! The other great part? 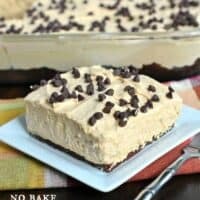 This is a no bake recipe. So you can assemble it without every turning on your oven. Nice, right? Now…go grab a few bags of Brownie Brittle and get in the kitchen to make a batch of these Pumpkin Cheesecake bars today! ENJOY! In a food processor, add Brownie Brittle and pulse until fine crumbs. Add melted butter and pulse again until fully combined. Press mixture in bottom of 13x9 baking dish. In a large mixing bowl, beat cream cheese and sweetened condensed milk until light and fluffy (about 4-5 minutes). Add pumpkin, lemon juice and spices. Beat until combined. Fold in Cool Whip and spread over Brownie Brittle crust. Garnish with chocolate chips on top. Refrigerated for two hours until set (or overnight). Serve and enjoy! YES! I adore me some Brownie Brittle. The stuff is SO addicting. It only comes second to my love for all things cheesecake. How did you know this would be my most favorite thing of all the things?! Pinned! Okay how do I not know about brownie brittle? I need to try this stuff and this recipe! Aimee what do you do with all those incredible sweet treats you make? I try to plan our baking days around our “visiting friends and family” days! ha! My husband just picked up some brownie brittle at the store last night, and we’re hooked! So good! 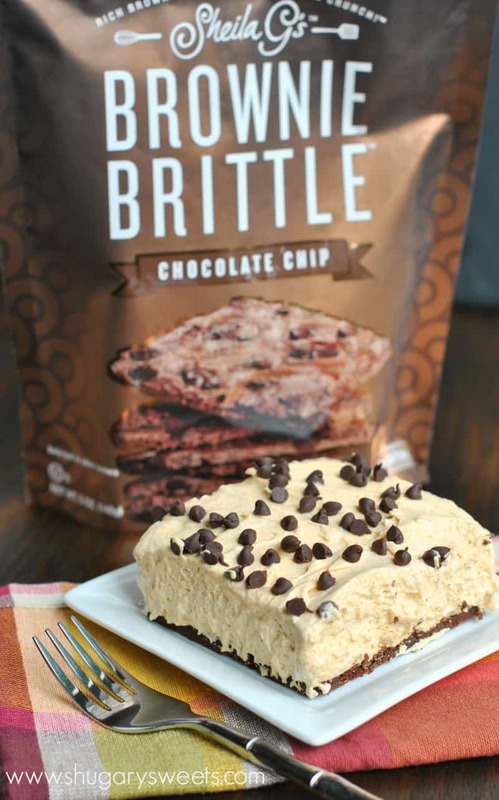 How have I not heard of brownie brittle?? 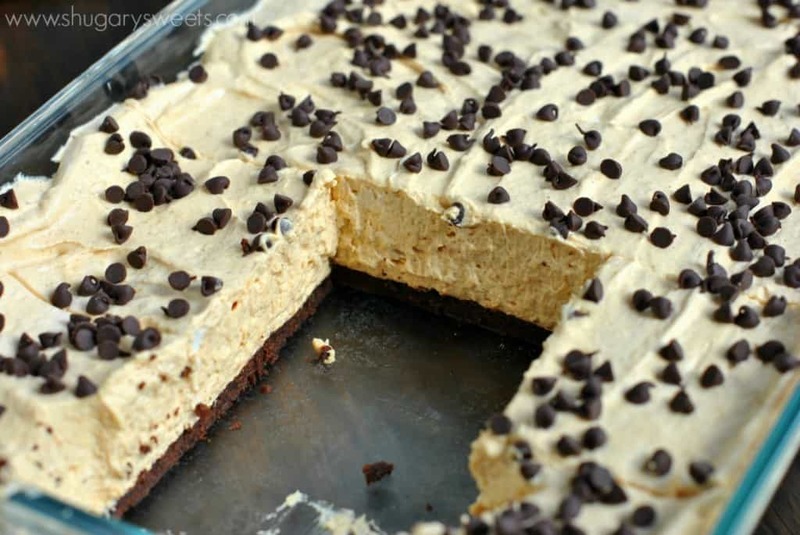 I want a giant slice of this right nowww!! This brownie brittle stuff sounds amazing! I am way out of the loop on all of the cool things to bake with. This pumpkin cheesecake look so dang good, Aimee! I must buy brownie brittle! I still have never had Brownie Brittle…(hanging my head in shame). This dessert alone is making me want to run to the store so I have this for dessert!! Cream cheesecake that doesn’t need baking – I am in! This looks so good! Brownie brittle is amazing! 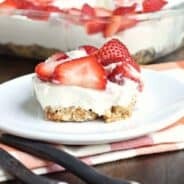 No bake is even better! This is perfect! This does look like it’s worth controlling myself for! Buy extra bags 🙂 hehehe!! What a great way to use Brownie Brittle! Looks scrumptious! I have not tried this brownie brittle, precisely because I am certain I would not be able to stop! 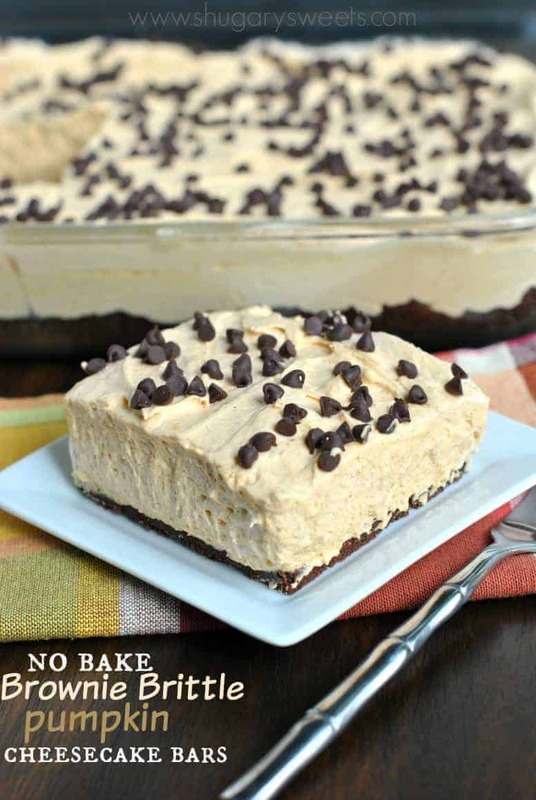 I love how you used them in this no-bake recipe. No bake cheesecakes are just plain awesome, aren’t they? Thanks for pinning. And get to the grocery store, haha!! This cheesecake looks divine! I’m definitely going to have to bake this for the holidays. I can’t wait to try this; thanks so much for sharing! I’m definitely craving brownie brittle now! This looks amazing! It’s so good, I can’t stop when I start! I have been eating brownie brittle for 1+ years now and never even though to use it in a recipe. This looks like the perfect place to start. Pinned! Just a few of my favorite things: Brownie Brittle, Pumpkin and Cheesecake! Can’t get much better than this! Oh I think you should just ship a whole pan of these to me RIGHT NOW. YUM! I love me some brownie brittle!!! Those bags of goodness never last long in our house!! I love that you made a brittle crust for that yummy no bake pumpkin cheesecake. It looks so creamy and fluffy…I wanna die!!! 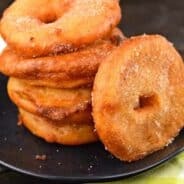 hi,I live in the UK and really want to make this but can’t get cool whip, is there a substitute I can use? Thanks! 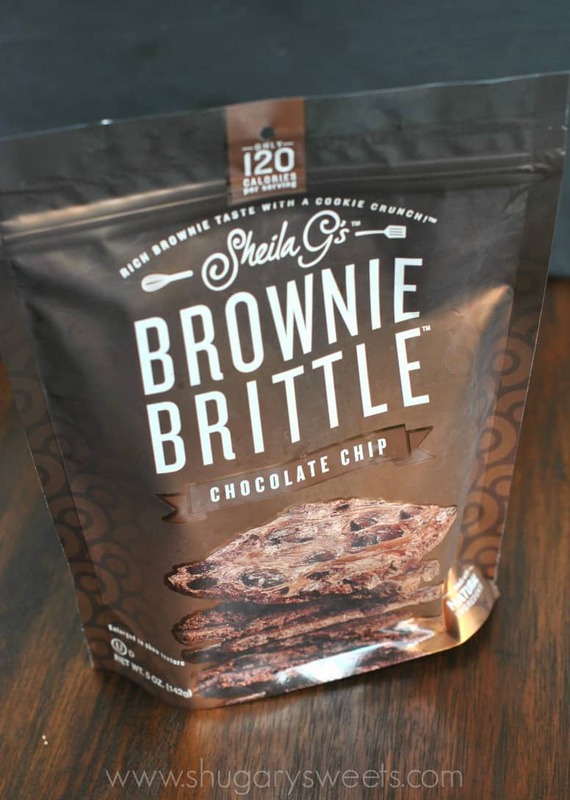 Where can i find this brownie brittle?